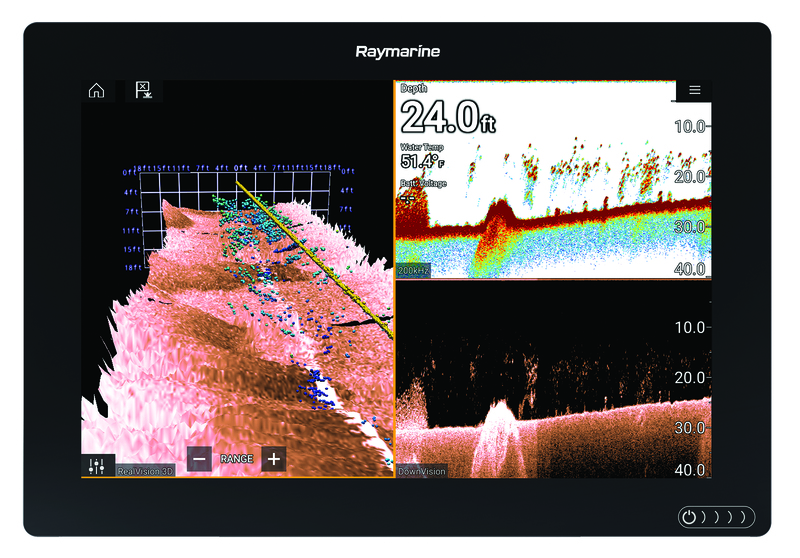 Raymarine's Axiom combos introduce gyro stabilization, which compensates for the motion of the boat to produce more lifelike 3D scanning sonar images. Raymarine’s CP200 Sonar Module with CHIRP SideVision™ scanning sonar, combined with their CP100 DownVision Sonar, gives a 180 degree view. 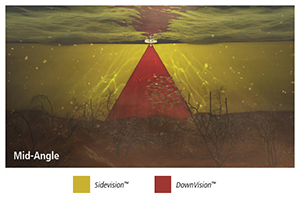 The angles of the SideVision™ sonar are adjustable for shallow or deep water. Mid-angle for medium depths is shown here. 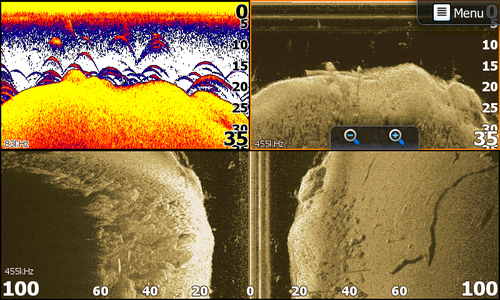 Scanning sonar produces near-photographic quality sonar images, like those shown in the screenshot above. Instead of a cone-shaped beam, scanning sonars sweep a narrow beam of very high-frequency energy (often 455 or 800kHz) from side to side, producing “slices” that are combined to create the highly detailed images shown. Views like this can help fishermen and divers find structure, wrecks and other underwater features more precisely than with traditional sonar. Compare this to a traditional sonar. It operates at a lower frequency, usually 50kHz and 200kHz. The cone-shaped beam of the typical transducer is 20 degrees or less, so if you’re fishing in 10 feet of water, you’ll see an area of with a diameter of about 3 feet. If you’re lucky, a fish will swim into the beam, and you’ll see it on your display. When a school of fish swims below your boat, you’ll see a red blob, and you can interpret that image, based on water temperature and location, and guess that you’re looking at a school of small individual forage fish. Some scanning sonar models have had three beams that look down and to both sides of your boat, often with three transducer elements that produce a wide (180 degree side to side) and very thin (1.5 degree to 3 degree fore and aft) beam. 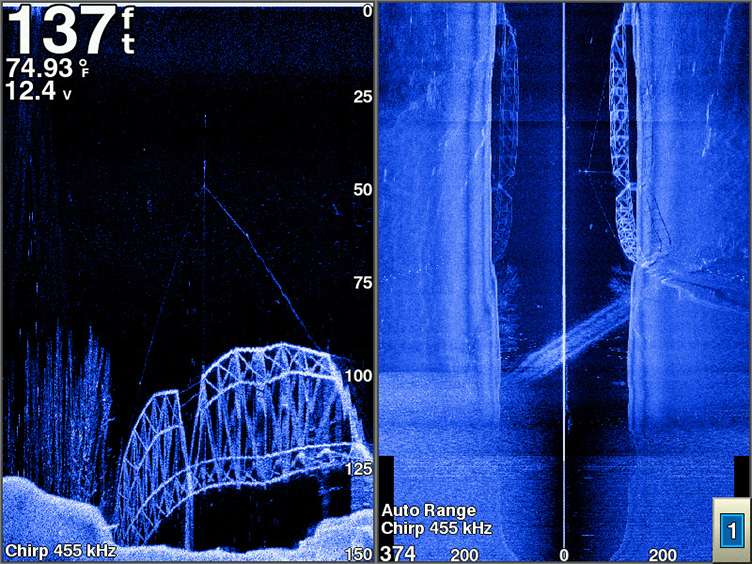 Lake Murray bridge using Garmin SideVü (right) and ClearVü (left) scanning sonar at 455kHz, enhanced by CHIRP technology. Scanning sonar removes much of the guesswork from this situation. Higher frequency sonar resolves the red blob into a school of small, white dots. You can even see a pack of hungry predator fish attacking the school of baitfish. The basic concept here is that higher frequencies generally give you better clarity and resolution, but do not penetrate as deeply as lower frequencies. The Lowrance StructureScan HD, for example, has a maximum side-scan range of 600 feet, using 455kHz and trolling slowly through the water at 2 to 8mph. Its maximum depth is 300 feet. This is the typical range for these side-scan units—two football fields on each side of your boat—exponentially multiplying the bottom coverage over conventional sonar. This technology is great for looking into shallow water and finding structures where fish hide such as brush piles, docks, channels, and other ledges, humps and bumps. You can observe from a distance and when you see something interesting, easily create a waypoint on your GPS-interfaced display for later reference. Or you can move in quietly and drop your hook. Side-scanning sonar fills the bottom of this screen. Upper right is down-scanning sonar. Upper left is CHIRP sonar. 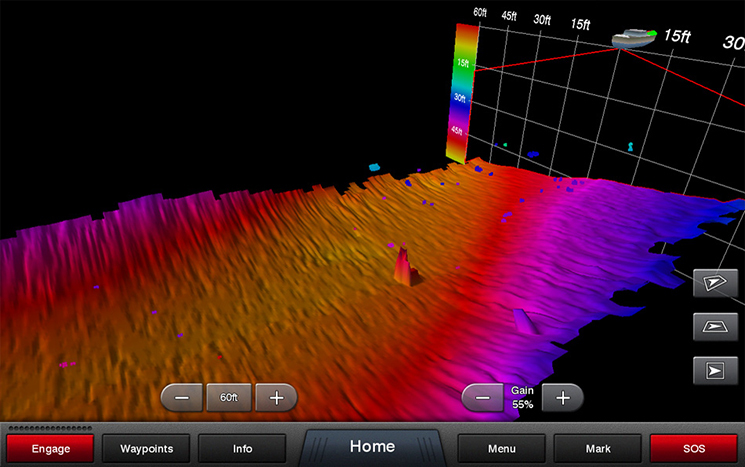 This screenshot is from a Lowrance SonarHub module, networked with an HDS gen3 display. You can easily customize what you see onscreen on your fishfinder with just a few quick drag-and-drop motions on the touchscreen. Many anglers will show their side-scan image full-width across their display. They will also have traditional 50/200kHz sonar, which is still superior for displaying big fish arches in a way most fishermen find familiar, and down-looking scanning sonar. Some fishfinders combine high-frequency imaging with CHIRP technology. Because CHIRP sonar transmits more energy directly into the water column, it yields further improvement in range and clarity compared with traditional sonar. To find out the details on how CHIRP works, see our West Advisor on CHIRP sonar. With CHIRP or without, side-scanning sonar is here to stay and can help you locate the fish while staying on them. It’s a great new tool for any angler who fishes in less than 600 feet of water. 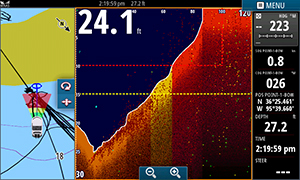 RealVü 3-D Historical mode is used for finding fish while your boat is moving. This shows the entire water column you have passed over in 3-D, from the bottom to the surface and all of the fish in between. Garmin Panoptix™ Down PS30 transducer. The newest type, three-dimensional scanning sonar, also operates at high frequencies but adds a multi-beam scanning transducer with multiple receiving elements. It produces three-dimensional, 180 degree high-resolution images. The Lowrance StructureScan® 3D sonar module and the Garmin Panoptix™ PS30 Down Transducer are examples of this type of sonar. You can manipulate the 3D images on your screen and pan, tilt or rotate the image to change perspective. The images are simple to interpret. You can even watch your lure or bait and the fish inspecting it in real time! 3D scanning sonar allows you to easily understand where fish and fish-holding structures are located in relation to your boat. By slowly idling over a potential fishing area with the wide, 180 degree scanning range, you can quickly search for key areas and cover abrupt depth changes, points, ditches, rock piles, brush piles, weed beds, standing timber or wrecks. ForwardScan transducer shows shallow water ahead! It aims forward of your boat. The yellow line is the warning line while red indicates dangerous shoaling. No survey of sonar technology is complete without a discussion of steerable transducers like the Simrad ForwardScan® and Garmin Panoptix™ PS31 Forward Transducer. You can aim these in any direction as if you had a periscope looking down in the water. Some of these steerable models mount on your trolling motor, and you turn the motor to point the beam where you want to look. 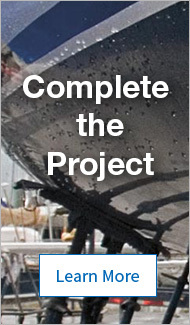 Others, like the ForwardScan, are thru-hull transducers that are mounted near your bow. The aiming function happens inside the multi-element transducer. Besides finding fish, these units are invaluable for navigation in a narrow or winding channel. You can see rocks and shallows, and avoid running aground. ForwardScan shows you color-coded depth indicators; green for deep water, yellow for medium depths, and red for dangerous shoals. It’s also good for finding a secure anchorage. Not just for fishermen, ForwardScan is popular with owners of cruising sailboats and cabin cruisers, and connects via NMEA 2000 with compatible Simrad and B&G displays.